Window treatments that open and close automatically throughout the day at pre-set times or with a press of a button. The most common motorized shade, the roller shade comes in a variety of configurations. The roller shades can be installed inside the existing window frame, outside the framework and mounted on the wall, ceiling or drop down from a recessed pocket. There are literally hundreds of fabric choices from ultra-sheer to total black-out. Offered in battery-operated and manual configurations, the honeycomb shades require no wiring. Plug and play. 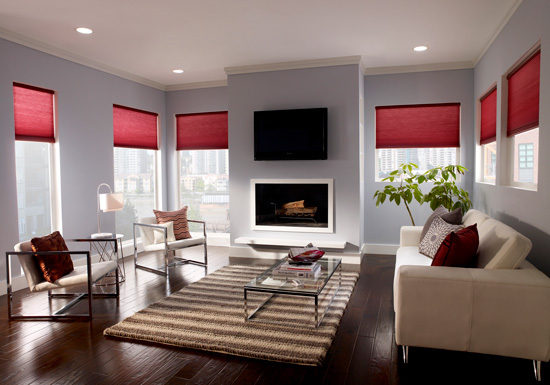 Shades come in three styles; single-cell sheer, double-cell light-filtering and single-cell room-darkening fabrics. Available in single and tandem track configurations, drapery tracks add a soft and smooth touch to your décor. An entirely new type of window treatment, this system gently pulls the drapery up and out of the way by using new technology. Optional roller shade can be integrated with this design. Traditional window covering offering system height and slat angle management. Optional styles include wooden and aluminum slats. With a revolutionary design, lifting cords associated with normal roman shade construction is eliminated. Optional styles include hobbled, knife, flat and casual soft styles. Innovative tension system allows functions such as skylight, angled or bottom-up motorization. Concealed-cable guides a taut fabric in self-contained channels.